Grace Kelly wears classic round frames on a film set, 1953. Kate Hudson and Goldie Hawn make quite the mother-daughter duo, 1992. Jennifer Aniston keeps her small frames close at all times, 1996. You never know when you'll need them! Jack Nicholson masters the clubmaster style, 1988. Gregory Peck in classic aviators, 1948. Gene Tierney lounges poolside in tortoiseshell frames, 1940. Elizabeth Taylor is movie star glam in a huge pair of round shades, 1968. Diane Keaton on the set of Annie Hall, 1978. Who said sunglasses had to be black? Cher looks cool in white, 1986. The shades make Brad Pitt's outfit, 1988. Ben Stein poses on top of a car, 1980. The men of 98 Degrees pose in the classic sunglasses brand, Ray-Bans, 2000. Bob Dylan in the classic wayfarer style, 1968. Lauren Bacall in cat-eyes and Humphrey Bogart match their shades, 1944. Prince Charles wears classic Ray-Bans, 1994. Audrey looks elegant as always, 1961. Sunglasses, or a form of them, have been around since the Roman Empire. It is said that Emperor Nero wore polished emerald green gemstones to watch the gladiators fight in 60 AD. Now, it's possible that he really just preferred a green tint to his fighting, but more than likely it had to do with the sun. For a very different reason, judges in China during the 12th century were seen wearing smoke-colored quartz lenses over their eyes throughout trials. They wore these so that they wouldn't accidentally betray their thoughts with their eyes before revealing the verdict. In Europe, the first recorded (painted, that is) evidence of sunglasses came about in the 1350s in Italy, when Tommaso da Modena depicted them in a painting. About 80 years later, corrective leses were created in Italy, and it was around the 1600s that conclave lenses came to be. The next century saw the creation of sidepieces that would help keep these glasses on your face (whether corrective lenses or tinted) -- invented by Edward Scarlett. In the U.S., Foster Grants were first sold on the Atlantic City boardwalk in the 1920s (the same brand whose advertisements "Who's Behind Those Foster Grants" drastically increased the popularity of sunglasses in the 1960s), and the "aviator" came to be not long after. The Army Air Corps commissioned Bausch and Lomb in the 1930s to create a lens for pilots to protect their eyes when they're at a high altitude. In 1936 Ray Ban released the "aviator" sunglasses which were given to pilots for free. Just one year later the stylish shades were released to the public. 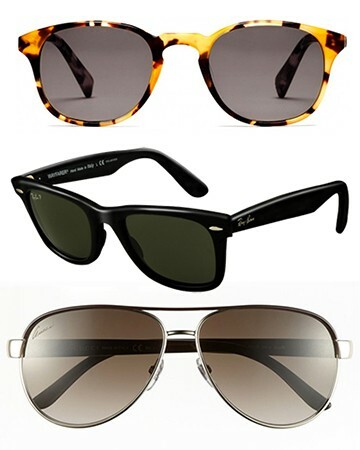 Ever wonder which style of sunglasses has been the most popular through the years? It's certainly not the cat eye or oversized shades of today, not even the aviator. The winner in this category is the Wayfarer -- the classic look born in the 1950s. In the most recent decades, sunglasses have become an essential item -- not just for protecting your eyes from the sun's harsh rays, but for fashion. A look isn't complete without a great pair of sunnies, and when you're protecting yourself and wearing one of the most popular accessories today, it's really a win-win. Click through the gallery above to see some of our favorite stars in stylish shades through the years.